The Royal Mint (the producers of British coins) have launched a competition to design a 50p coin for the London 2012 Olympics. 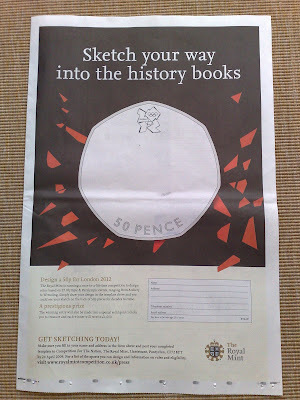 Members of the public can submit their London 2012 50p designs and the winner will see their sketch on the back of 50p coins 'for decades to come.' The winner will also receive £1,000 and a solid gold version of the London 2012 Olympic coin. A shortlist will be drawn up by committee and the Queen will personally approve the winning design! This is another nice idea to generate public involvement in London 2012 with a unique prize at the end of it. I hope we see more things like this over coming months!